Did you know that the first wearable computer is linked with finance, information theory and roulette? Currently, I am writing up a seminar that I will give at my Alma Mater. I have two different seminars in mind and might (in the spirit of progressive rock) bolt the two unfinished works together into a behemoth and leave the audience to make of it what they will. My research has sent me back to the history of information theory and the discovery of a paper written by Ed Thorp entitled "The Invention of the First Wearable Computer". Believe it or not the device was created in 1961! At the famous Bell Labs worked a genius by the name of Claude Shannon who was allowed to let his mind flow in any direction that pleased him. To that end in 1948 Shannon wrote A Mathematical Theory of Communication, the seminal paper on Information Theory, in part to assist Bell Telephone's headaches with increasing complexity from burgeoning post-war telephone use. A colleague of Shannon's was John L Kelly, who used the new Information Theory to develop what is now known as Kelly Criterion, used by gamblers and investors alike to maximise the return on their investments. Mathematician Ed Thorp became a friend of Shannon's when they discovered that they had a joint interest in gambling. The two of them decided to look at roulette (which Thorp had done some preliminary work on) and how they could use physics and information theory to gain an edge over the house. From their research they developed the first wearable computer, to be surreptitiously taken into a casino to beat the game of roulette. Thorp and Shannon's intentions were to treat a roulette wheel as a Newtonian system and determine into which octant of the wheel the ball, orbiting the rotating wheel, was likely to finish in. It wasn't necessary (nor feasible - chaos theory is for another day) to determine the exact cup the ball would fall in, just enough of a guess was sufficient to gain an edge over the house. They could bet on all the numbers in the octant and still have a positive expectation. Thorp also developed card counting through computer simulations and used Kelly Criterion to gain an edge over the house in the game of blackjack. Thorp and Shannon paid many visits to Las Vegas where they profited on the blackjack tables. The team made only made dry runs with the roulette computer. Thorp had by then turned his attentions to the financial world, profiting from market inefficiencies and decided to make the roulette computer common knowledge. In the early 1970s a team of students from the University of California, headed by Doyne Farmer, used the recently developed microprocessor to improve upon Shannon and Thorp's analogue roulette computer and beat the game in Nevada's casinos. Later, Farmer (with a few friends from his roulette escapade) went on to create The Prediction Company, which was one of the first to perform algorithmic trading in the financial markets. So you see there are quite a few connections here even for James Burke to make a television programme out of. Now, why didn't he? Fortune's Formula - covers much of the work of Kelly and Thorp. 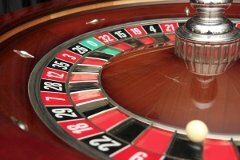 The Eudaemonic Pie (aka The Newtonian Casino) - How a team of students beat the game of roulette. The Predictors - How a team of academics created an algorithmic financial trading company.